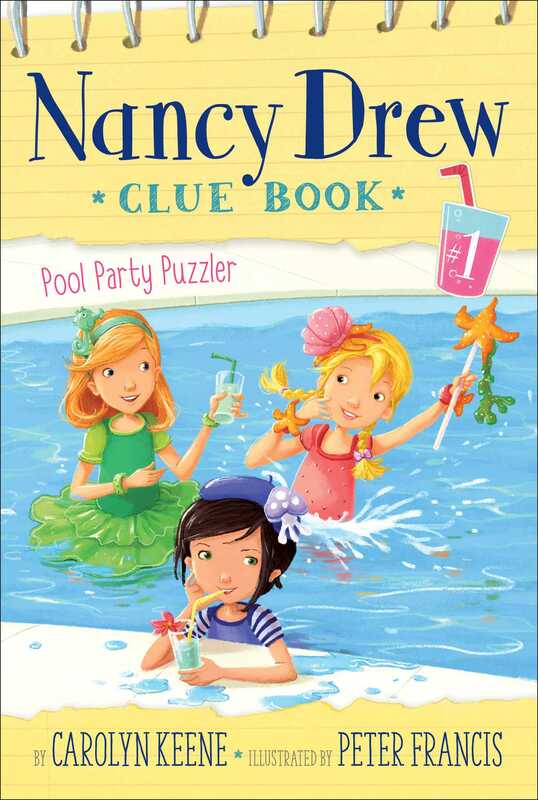 Help Nancy and her friends find out who’s causing a major pool party problem in this first book in an all-new, interactive Nancy Drew chapter book series. Includes space for readers to jot down their own ideas and solutions to the case! Snooty Deidre Shannon writes in her blog “Dishing with Deidre” that since eight is half of sixteen, she’s entitled to a Super Sweet Half-Sixteen party this year! And since the Shannons have a pool, she’s decided to make mermaids her theme. Nancy, Bess, and George are invited to the big bash, where all party guests must dress in under-the-sea-themed costumes. For her grand entrance, Deidre dresses as a mermaid and is carried out on a giant half-shell by six teenage “sea creatures.” The garden boasts hedges clipped into the shapes of various types of ocean life. Deidre’s father even booked “Queen Mermaid Marissa” to perform in their pool—fin and all. But when a squirmy snake is found swimming in the pool too, Queen Marissa leaves in a huff! Who would sabotage the mermaid pool performance? Nancy, Bess, and George intend to find out! Nancy Drew looked up from the goody bag she was filling for Deirdre Shannon’s sweet half-sixteen party. It was summer vacation and the theme of Deirdre’s party was Beach Party Blast. Nancy, Bess, and George had come extra early to help George’s mom cater the party. Louise Fayne had catered lots of kids’ birthday parties, but nothing as fancy as this! “Our own detective club called the Clue Crew!” Nancy answered with a smile. Nancy, Bess, and George high-fived. The three best friends loved solving mysteries more than anything. They even had their own detective headquarters in Nancy’s room! Nancy’s father wasn’t a detective, but he was a lawyer. To Nancy that was the next best thing. “But we already write down all of our suspects on your computer, Nancy,” George pointed out. George loved electronic gadgets more than anything! Nancy brushed aside her reddish-blond bangs to look around for Deirdre. She was probably getting ready for her grand entrance. Mrs. Fayne said it would be at one o’clock sharp—after the guests arrived. Nancy smiled as she looked around the Shannons’ backyard. It looked more like a beach than a yard. There was real white sand and beach umbrellas around the pool. On each party table was a sand castle centerpiece surrounded by shells and starfish. Inflated palm trees dotted the lawn. So did some of Deirdre’s birthday presents—like a shiny lavender electric scooter with a matching helmet! “What kind of lunches?” Bess asked. George suddenly stopped walking. “Hey, check it out!” she said, pointing to something in the distance. Nancy and Bess looked to see where George was pointing. A woman wearing a sun hat was busily snipping hedges behind the pool. The three hedges were shaped like sea creatures! “Let’s get a closer look!” Nancy said excitedly. The girls hurried over to the woman. She was in the middle of trimming the claw on a hedge shaped like a crab. “I’m what they call a garden designer,” the woman replied with a cheery smile. “My name is Taffy, and I create topiaries.” She pointed at one of the leafy hedges. “Did Deirdre see these topiaries yet?” George asked. But Taffy shook her head and heaved a sigh. “You mean she wanted a grassy statue of herself?” George asked. “That sounds like Deirdre, all right,” Bess said. Nancy wondered what the surprise would be. Before she got a chance to ask, Bess shook Nancy’s arm. “The other guests are here!” Bess announced. Nancy turned to see other kids dressed like sea creatures in the Shannons’ backyard. The most awesome party of the year was about to begin! After saying a quick good-bye to Taffy, the girls ran to join the others. Many were dancing. Some were sipping smoothies. Nancy recognized Kendra Jackson, Marcy Rubin, and Henderson Murphy from school. But there was one kid no one knew. “Who’s that?” George asked. She nodded toward a kid wearing a green sea monster costume. A mask and headdress totally covered his or her face. Both hands were stuffed inside gloves with long webbed fingers! The girls walked over to the sea monster kid. The kid shook his or her head, then walked away without a word. “We still don’t know who she is,” Bess said. “How do you know she’s a she?” Nancy asked. Nancy giggled. Bess and George were cousins but totally different. Bess had blond hair and blue eyes, and she loved clothes more than anything. George had dark eyes and curly hair. She was fine with new clothes as long as they had enough pockets for her electronic gadgets! “Last one there is a rotten coconut!” George declared. The kids gathered on the patio to watch. A trumpet blared as four teenagers wearing huge fish headdresses marched around the side of the house. In each of their hands was a pole. Resting atop the four poles was a giant half-shell throne! Nancy couldn’t believe her eyes. Waving down from the elaborate shell was Deirdre. The birthday girl was dressed in a glitzy mermaid costume and shell-covered crown! The teens made a sudden sharp turn and the throne tipped. Deirdre screamed as it swayed back and forth!